Adam Rogers is the Content Marketing Manager at Kayako, the help desk software to grow personal customer relationships. Adam loves creating long-form content, check out his latest guide on customer service training. Everyone loves B2B email newsletters, right? Wrong. Emails can be headaches for both the marketing teams who create them, and the customers who receive them. Many marketing emails suffer from poor design and low click rates. Even with the best efforts, click rates can remain stubbornly low. But email marketing remains one of the best (if not the best) digital marketing channels for return on investment. According to a study by Econsultancy, 22% of companies rated email as having an excellent return on investment, and it beat even SEO and content marketing for ROI. So why are your campaigns not performing as well as they could? The average click rate on B2B emails is 5.27%, versus an open rate of 23.84%. These are disappointing results for most marketers, but there is a simple option to improve your click rates. You may have thought it was your snazzy copy or amazing deals that engaged your audience, but you’d be wrong. We’ll tell you why. Changing your newsletter design will most likely increase the click rates of your campaigns. Read on to find out what supermarket jam can tell us about the design of your marketing emails. 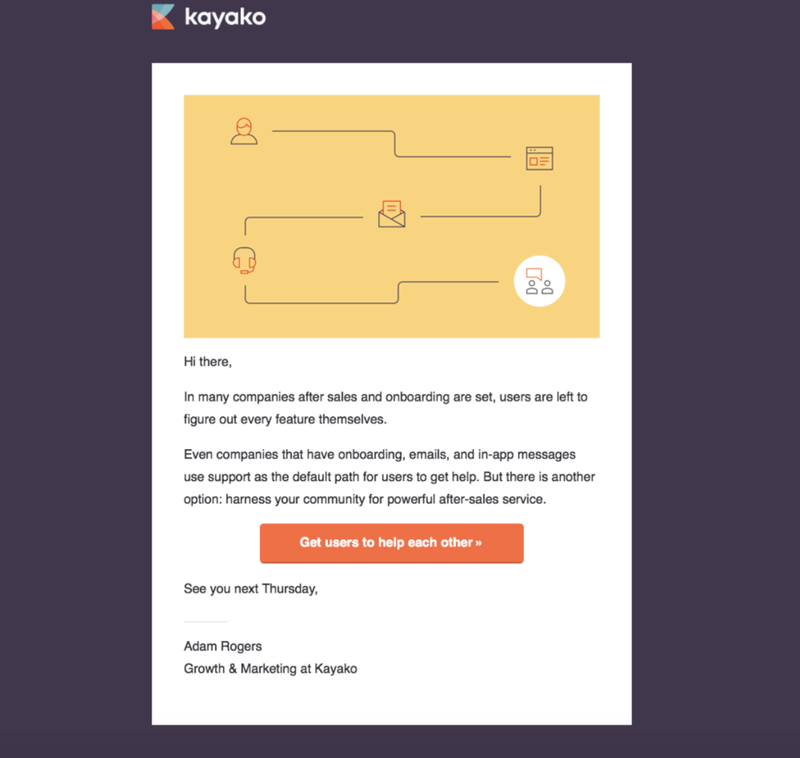 At Kayako, we’ve been building an inbound funnel since 2015. At the end of the year, I’m able to use the down time to look into our analytics thoroughly. Last year I discovered that there was room for improvement in our click rates. They weren’t where we wanted them to be. Email marketing is extremely valuable for engaging and converting your customers, but many companies aren’t doing it in the right way. Brands are especially prone to sending their subscribers emails that aren’t relevant, don’t get clicked, and end up in the trash can. But this wasn’t working for us. This is partly because of the templates available in popular email marketing software. But another issue was not empathizing with our audience too well. For Kayako, we send a weekly email to busy customer support folks. Support departments are often underinvested and their inboxes are packed with requests for help. For our newsletter, we can’t send them a big lengthy read with a ton of links to check out. Instead, we switched to offer up the best of our blog that week with a short lede and call to action to read the post. Now we want to ask you to let your creativity free, and approach email design with minimalist flair. 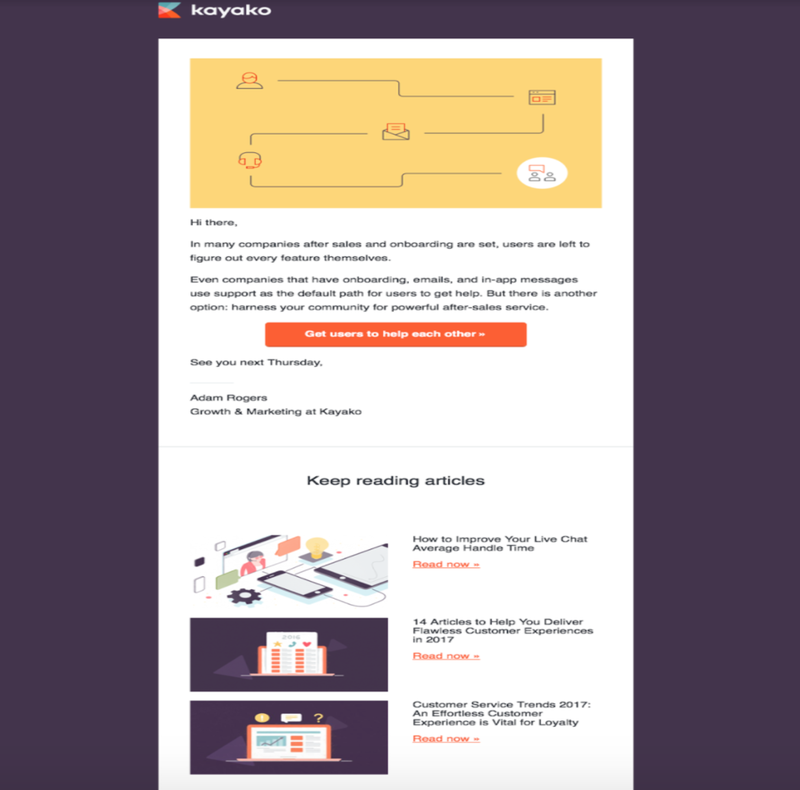 Below is what the overhaul of the Kayako newsletter looked like. We went from a bi-monthly plain text email with three links to the blog, to a much more visually appealing weekly one-shot format. The new design directed our subscribers to the one article we thought would interest them most that week. When we changed our email campaign design like this, the results amazed us. Click rates doubled in our December newsletter. Or to put a value on it, an increase in click rates at 97.03%—which was a huge success for our experiment. Let me explain why this happened. There’s a strong relationship between supermarket jam and email marketing for the following reason. Ever heard of Sheena Lyengar’s famous jam study? When participants were presented with a choice of 24 different flavours of jam versus 6 flavors, 3% of customers made a purchase after viewing 24 flavors. Amazingly, 30% of customers bought jam after seeing only 6 flavours. The conclusion of the study was that human beings are paralyzed when faced with too many options. A plethora of choices is actually demotivating, rather than inspiring. The results from our first experiment illuminated that our subscribers responded better to weekly campaigns than bi-weekly, and emails that contained only one choice of content. But we needed to find out just how significant choice really was. We decided to apply our findings to our own email marketing again by isolating the factor of choice in an A/B test. Is design or choice the motivating factor? Version A: feature post, and 3 supporting links. Version B: single feature post. Our hypothesis was that if reducing choices was the getting more clicks, version B (the single feature post email) would have more clicks. If we were wrong, then we’d be getting more bang for our buck out across clicks to our content in one email. With version B, we stuck to just one featured post, and no more links. We ran our A/B test for 8 weeks using Kayako data, and guess what? No dramatic difference in performance. Version A accumulated 13 more clicks in the 8 week experiment. Subscribers weren’t put off by the extra articles to read. So our conclusion was that choice is not always demotivating. Having a clear intent to your emails and sending them regularly is important. When are you updating your email design? B2B emails tend to follow the same format, and often fail to inspire readers. They have one major flaw: too many choices. 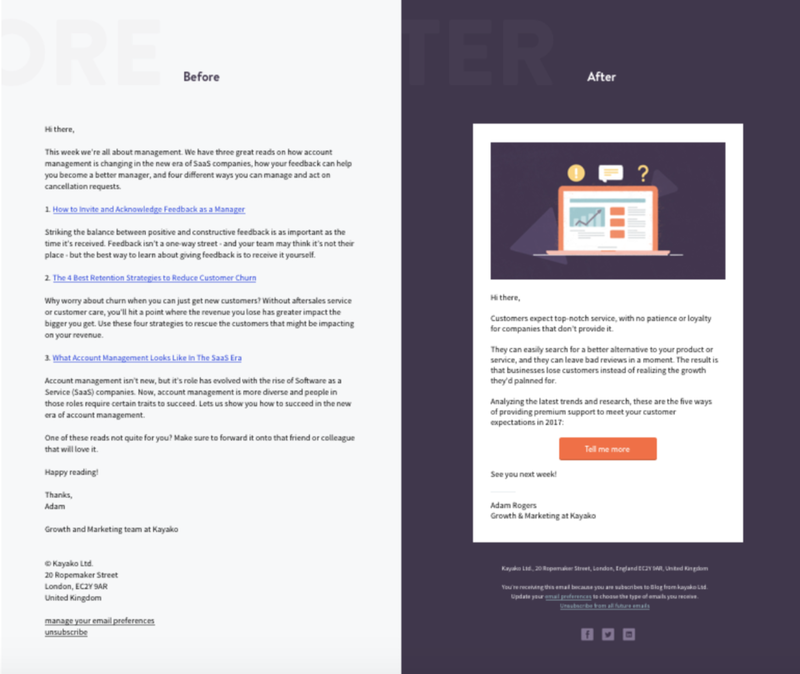 Try out simplifying your B2B email newsletter design with an A/B test, and see if your results improve. The reason you want more clicks in your emails might be because you’re trying to move your audience down the funnel or keep up engagement. Ideally, every piece of content you include must contribute towards achieving your goal. Including as much content as possible, however, doesn’t give your subscribers more incentive to click through. You’re actually demotivating clicks with excessive choice. You’re lessening the chance that they’ll engage with your emails. Keep your B2B marketing emails laser-focused. Don’t confuse your readers by offering them all the content you published last month. Instead, tell them exactly what to expect in your email subject title, and keep your email body strictly limited to that topic.